Please continue to submit observations after spending time diving or tidepooling. We are constantly updating our website with the latest reports, and will update the map on a regular basis. Please remember to fill out a log even if you search and only find healthy sea stars, or no sea stars! This information is just as valuable as observations of diseased individuals. Over the past few weeks, we have had a marked uptick in the number of observations of sick sea stars submitted to our SSWS tracking map. Current “hot-spots” appear to be in British Columbia and Washington—both on the outer coast and within the Salish Sea—as well as near Santa Barbara, California. These are the same areas that were heavily impacted in the initial months of the coast-wide mortality event due to SSWS that began in 2013. In the north, affected species include the mottled star, Evasterias troschelli (heavily impacted in some areas), the ochre star, Pisaster ochraceus, the short-spined star, P. brevispinus, and perhaps most alarming, the sunflower star, Pycnopodia helianthoides—a species that suffered tremendous loss during the first wave of die-offs, and was only recently beginning to show slight signs of recovery in the northern portion of its range. Further north, in Southeast Alaska, observations are mixed, with numerous sick/dying P. ochraceus reported in Kasaan Bay and on Prince of Wales Island, but only low levels of diseased stars in Sitka. In the Santa Barbara region, reports describe large numbers of diseased and dying bat stars (Patiria miniata), a species that was not heavily impacted in 2013/14. Other affected species include P. ochraceus, P. giganteus, and the sea cucumber, Parastichopus californicus. Further south, along the Palos Verdes Peninsula, dead and dying red and purple urchins (Strongylocentrotus franciscanus and S. purpuratus) were reported as washing up on shore in late August. Elevated sea water temperatures and a broader range of affected echinoderms (urchins and sea cucumbers in addition to sea stars) have lead some researchers in southern California to conclude that the current die-off might be due to “warm water wasting”, distinguishing this event from the 2013/14 event in which water temperatures were well within normal and only sea stars were impacted. Further south along the coastline of Orange County to San Diego, sea star and urchin numbers are still so depressed in the intertidal from separate disease events in 2014 (sea stars) and 2015 (urchins) that it would be difficult to detect a new die-off. As of the end of August, SSWS was present, but only at low levels along the coast of Oregon south to central California. We have received reports from a few locations within the Salish Sea region of Washington that SSWS has re-emerged and is again impacting substantial numbers of ochre and mottled stars (Pisaster ochraceus and Evasterias troschelii). Elsewhere, including British Columbia, the outer coast of Washington, and north/central California, the disease has persisted at a low level. Many areas continue to have much lower numbers of stars than were present prior to the SSWS outbreak that began in late 2013 (see long-term summary graphs of ochre star trends here: https://www.eeb.ucsc.edu/pacificrockyintertidal/sites/sites-target-species.html#pisaster, and more recently established citizen science summary graphs here: https://www.eeb.ucsc.edu/pacificrockyintertidal/data-products/collaborative-monitoring/index.html). While quantitative subtidal data are rare, observations from divers ranging from British Columbia to central California suggest that the severe decline of the sunflower star, Pycnopodia helianthoides, has resulted in striking changes at some reefs. Substantially higher numbers of urchins are now visibly present in some areas, likely due to both a change in behavior of existing urchins (no longer hiding in crevices from sunflower stars) and recent successful recruitment/survivorship of juveniles. The absence/severe decline of sunflower stars, a major predator on urchins, has resulted in increased urchin grazing in open areas, which has led to an ecological shift on some reefs from algal dominated communities to “urchin barrens” consisting largely of bare rock and crustose algae. We will no longer be collecting public juvenile sea star counts or updating the juvenile observations map. Too few of these observations have been submitted to be able to observe trends. We are continuing to regularly update the Sea Star Wasting Syndrome map so please continue to send in those observations; if juveniles are observed this can be noted in the Additional Information section. If interested in the recovery of the ochre star, Pisaster ochraceus, please see MARINe's Site Pages and Trend Graphs to view size trend graphs. There you can see which MARINe sites have seen an influx of juvenile ochre stars. You can also generate your own graphs using MARINe's Graphing Tool. During summer 2017, MARINe continued long-term monitoring of sea stars from Alaska to California. Three sites in southeast Alaska were sampled in August. Disease was not observed at Sage Beach, though abundance of Pisaster ochraceus remains low in the monitoring plots. Disease presence was highest at Kayak Island with over 16% of P. ochraceus showing symptoms during that sampling day; six of the 109 individuals were severely diseased. Disease was not observed at Pirates Cove. Most sites in the Salish Sea region of Washington show little sign of recovery. The large pulses of recruits observed at some sites in 2014 and 2015 appear to have experienced high mortality rates, and diseased stars are still consistently present at low levels. There were a handful of sites (Big Rock near Point Whitehorn, and Larrabee State Park) where juveniles appear to be surviving, and populations are trending toward recovery, but stars with signs of SSWS are present even in these areas. On the outer coast, P. ochraceus populations have generally experienced less decline due to SSWS than most other regions, but diseased stars were documented in August, so the long-term impacts of the disease are still unknown. Two sites were sampled in British Columbia during July; Duck Island and a new site, Hakai, were sampled using biodiversity protocols. Disease was not observed at Duck Island. A low level of disease in P. ochraceus was observed at Hakai, though P. ochraceus is extremely abundant at that site. Fogarty Creek, Bob Creek, and Cape Arago sea star plots in Oregon were sampled during July. Fogarty Creek and Bob Creek had low levels of disease in P. ochraceus. Many of the individuals at both sites were under 40mm radius, though three of the 20-30mm Pisaster at Bob Creek were severely diseased. Disease was not observed at Cape Arago, but abundance remains low; only nine individuals were observed, with the pre-SSWS long-term mean being 73 individuals. Ecola sea star plots were sampled Aug 8-9 and a low level of disease was observed in P. ochraceus. In Northern California, only healthy individuals were observed at Cape Mendocino, Shelter Cove, and Kibesillah Hill. However, only casual and fairly brief observations were conducted due to lack of funding for monitoring these sites; these observations are not as rigorous as when full surveys are conducted. Also, eight sites along the north central California coast were sampled as part of Marine Protected Area surveys. 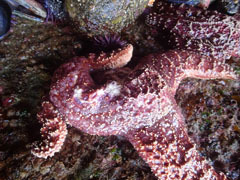 Low levels of disease in Pisaster ochraceus were observed at Point Arena, Stornetta, Del Mar Landing, Sea Ranch, Stewarts Point, Gerstle Cove, Chimney Rock, and Bodega. Bodega continues to have a large number of smaller individuals, 40mm radius and smaller, causing the abundance in these plots to be above the long term mean. In summary, disease continues to be seen throughout the west coast of North America, though at a low level for most sites. The pulse of babies first observed a few years ago at a small subset of sites continues to grow. A small number of these juveniles have been affected by disease, but the majority continue toward maturity. As they become sexually mature, the hope is that they contribute to recovery of ochre star populations. On Bainbridge Island, WA, an old dock slated for removal to make way for a new, more effective dock was home to many sea stars and other marine invertebrates. The removal of this dock could have meant death for all these critters that called it home, but luckily locals were paying attention. Senator Christine Rolfes’ daughter noticed the abundance of healthy sea stars reappearing on the old dock and brought it to the attention of the senator. Some phone calls later, and an effort was orchestrated involving Exotics Aquatics SCUBA and Kayaking center, Bainbridge Beach Naturalists, Bainbridge Island Land Trust, Bainbridge Island Rowing, and the City of Bainbridge Island. Local citizen scientist, Maradel Gale, contacted MARINe to discuss any potential issues with the planned relocation. Numerous volunteers removed dozens of sea stars, as well as a number of crabs, sea cucumbers, urchins, and other marine life and moved them from the old pier to pilings in the nearby ferry yard. This effort illustrates how citizen scientists can raise awareness and make a difference. Especially while SSWS continues to persist along our coast, every effort to give sea stars a chance at recovery counts. There is currently special interest in observations of Leptasterias spp. (healthy/sick/absent), which will be used by researchers at San Francisco State University and Santa Rosa Junior College to study potentially variable impacts of SSWD on sub-species of this star. All observations for Leptasterias spp entered on our website will be shared with the SFSU/SRJC group for their work on disease susceptibility and environmental variation (NSF ROA 1156452, CSU COAST, CSUPERB). For more information, check out this page from the Council on Ocean Affairs, Science & Technology (COAST) and this flyer for divers interested in citizen science. In February 2016, a scientific paper entitled Ochre star mortality during the 2014 wasting disease epizootic: role of population size structure and temperature was published by Eisenlord, et al. Their study reported that temperature plays a role in the prevalence of Sea Star Wasting Syndrome (SSWS). Analyses showed that risk of disease-associated death was correlated with sea star size as well as water temperature. In adults, time between emergence of disease symptoms and death was influenced by temperature. Experiments also showed that adult mortality was higher in the warmer water treatments. Although adults showed disease symptoms more quickly than juveniles, diseased juveniles perished more quickly. This study was conducted in Washington State, where high mortality rates were experienced during 2014 in many areas, which coincided with warm temperature anomalies. While this study explained some factors that lead to SSWS, their models indicate that other unknown factors are likely playing a role as well. Long-term monitoring of intertidal sea star populations by MARINe continued through fall. At sites south of Point Conception, ochre stars continued to be rare or absent and few to no new recruits were seen. Of the 16 long-term monitoring sites sampled by the UC Santa Cruz group during fall 2015 along the central CA coast, disease was observed in ochre stars at 8 sites. All ochre star abundances in plots were significantly lower compared with the pre-disease long-term mean, however three of the sites have shown rebounds in abundance due to an influx of juvenile stars. Most juveniles appeared healthy at the time of sampling. The percent affected at the 8 sites with disease ranged from <1 - 50%, with the percent affected at most sites <10% The one site with 50% diseased, Hazards, had a high rate of disease due to there only being two ochre stars in the plots, one of which was diseased. Purple urchins, Strongylocentrotus purpuratus, appeared healthy at most sites; however three urchins with lesions and balding patches were observed. 50+ purple urchin tests with lesions were also seen in the sea star plots at one site. Two long-term monitoring sites were sampled by UC Santa Cruz in Redwood National and State Parks. Both of the sites sampled had abundances of ochre stars higher than the pre-SSWS long-term mean due to an extremely large number of juveniles. Low levels of disease in ochre stars were present at both sites. Large abundances of the six-armed star, Leptasterias spp., were also present at both sites, all appearing healthy. Most MARINe sites in WA have not been visited since the last update was released in August, 2015, however, the few that were surveyed over the fall and winter of 2015/2016 continue to have reduced numbers of adult ochre stars and higher numbers of juveniles as compared to historic counts. A few notable observations were made by volunteers involved with the citizen science monitoring effort on Camano Island and Whidbey Islands, WA regarding possible “disease refuges” for Pisaster ochraceus. In December 2015, 4 floating cement docks were removed from just offshore of Camano Island State Park. Unbeknownst to those familiar with the docks, there had been a population of several hundred P. ochraceus living on the undersides of the docks. These were large individuals, which had clearly survived the 2014/2015 SSWS outbreak that resulted in sea star decline in areas surrounding the docks. Inspired by this observation, a diver on Whidbey Island (adjacent to Camano) who has regularly submitted observations to our organization documenting the impacts of SSWS to sea stars at sites throughout Whidbey, investigated some floating docks at Langley Harbor. There, he found the same thing—lots of large, healthy adult ochre stars—a rarity these days at most other sites on Whidbey. We’re not sure yet what to make of these observations in terms of disease spread and impact, but they underscore the importance of having lots of observers sharing information in a coordinated fashion, which could help lead to a better understanding this devastating disease. Spring 2016 MARINe long-term monitoring will begin this month. Priorities will include searching for recruitment of juveniles, and tracking the health of juveniles at sites where they are present. Possible community changes will be assessed through panoramic photos of the mussel bed, to see if decreased abundances of ochre stars create a shift in the habitat of their main prey species, Mytilus californianus, and associated community. UCSC intertidal researchers have continued to monitor sea star populations along the US west coast this spring and summer. From Washington down through central California most populations of ochre stars in the intertidal are currently showing low prevalence of disease (under 10% of population diseased, aside from one site at Cape Arago, OR at 13%). However, most of these sites show significant decreases in population size compared with the long term mean prior to this SSWS event, indicating a high impact overall. The handful of sites that do not show population declines have significantly fewer adults compared to past data, but have had an influx of juveniles which account for the seemingly “normal” population numbers. Sites showing healthy populations of juveniles include Fogarty Creek in Oregon, False Klamath Cove in Redwood National and State Parks, and Bodega Bay in Northern California. Most of these juveniles appear healthy, and will be reevaluated during fall sampling. Monitoring sites just north of Point Conception, at the southern end of central CA, tend to show higher prevalence of symptoms, though lower numbers of sea stars overall are likely the reason for this “higher” prevalence. One diseased star out of four observed yields a higher prevalence ratio (25% at Shell Beach) than sites where sea stars are more abundant (such as 16 out of 183, or 9% at Enderts Beach). The four Orange County monitoring sites in southern California turned up a total of four ochre stars, with two of the sites having zero ochre stars remaining in the monitoring plots. No symptoms were observed in these four stars, though past total abundance for these sites would have averaged over 150 sea stars, making the effects of this SSWS event apparent. In the Salish Sea/Puget Sound region of Washington, disease prevalence was low within plots at long-term monitoring sites when they were sampled in June (but note that population sizes were down substantially from previous years), but more recent observations from citizen scientists indicate that the disease is re-emerging in some areas. A few sites with high numbers of juvenile ochre stars and mottled stars in winter 2014/spring 2015 have shown significant declines. Very little is known about “normal” mortality rates in this smallest size class of sea stars, so it is possible that loss was due to predation (gulls were observed eating small stars), movement of individuals (e.g. to the subtidal), or they could have succumbed to SSWS. Sea stars with symptoms of wasting syndrome continue to be observed along the west coast of North America, and remain geographically patchy. Some sites monitored by citizen scientists in Washington, which had previously shown disease symptoms for many months, have recently been reported to have only healthy individuals, and in a few areas, substantial numbers of juveniles have been recorded. However, the opposite is true for other sites in Washington. Two of the long-term monitoring sites where SSWS was first observed in low levels in June 2013 (Starfish Point and Sokol Point), had disease prevalence ramp up in November 2014 to as high as 60%. While some sites were immediately highly impacted by the syndrome, these sites were not greatly impacted until nearly 1 1/2 years after the first symptoms were seen. As for the sites that are currently free of diseased stars, continued sampling will determine whether these sites are indeed beginning to recover, or whether they are merely experiencing a pause in the progression of SSWS. The current status of SSWS is unknown for many MARINe monitoring sites because bi-annual sampling for most sites occurs in spring and fall. Beginning this month, many sites along the coast will be resampled and we will be able to assess the condition of sea star populations in those areas. Several sites sampled in December 2014 in Redwood National and State Parks showed relatively low rates of infection, 6% to 20%; however, ochre star abundances at these monitoring sites had dropped well below the long-term average, likely due to the impact of SSWS. Qualitative observations also continue to be reported from locations along the coast where sea stars are conspicuously absent from places people have observed them historically. While not quantitative, these observations provide important insight to the overall picture of the impact of SSWS. As noted in the previous update, disease has also been seen in urchins in some locations along the coast. It is still unknown whether this is related to sea star wasting syndrome. Warmer than usual water temperatures may be playing a role, as has been the case in past events. In the last few months urchin disease symptoms have been reported in southern California and Baja California. MARINe researchers are currently developing protocols for monitoring urchins. These protocols were discussed recently at the MARINe consortium’s annual meeting, along with information sharing and regional updates about the progression of SSWS along the entire west coast. The northern-most observation of SSWS in the field is now Sawmill Bay, east of Anchorage, Alaska. While it was hoped that Alaska’s colder waters might provide reservoir populations of healthy sea stars, increased observations of disease in Alaska have made this unlikely. Affected mottled stars were seen this fall in Jakalof Bay, just west of Kenai Fjords National Park, as well as more observations of diseased stars around Juneau and Sitka, Alaska. Along the rest of the west coast, observations of disease continue throughout, but with varying levels of impact to sea star numbers. In Central California fall long-term monitoring surveys are currently in progress, but for those sites sampled, 9 of 16 (56%) showed declines in Pisaster ochraceus numbers due to SSWS. Sites experiencing “lower” impact have all lost large numbers of adult stars, but higher population numbers are present due to a large influx of recruits, or healthy baby sea stars. While diseased juvenile sea stars have been observed, the majority appear healthy thus far. Only time will tell whether these juveniles live to replenish populations, or become diseased themselves. Please keep your eyes open for juvenile sea stars and report them on our juvenile observation log. Another development since the last update is the recent observation in Southern California of wasting in other echinoderms, such as sea urchins. Urchin die-offs have occurred in the past during warm-water events, often associated with sea star wasting. It is unknown whether the current observations of urchin disease and die-offs are connected to SSWS, or are the result of another pathogen, potentially connected to the abnormally warm water temperatures that have been present in southern California. We encourage citizen observers as well as other researchers to monitor the condition of urchins and other echinoderms in addition to sea stars. Our updated disease observation log now includes a space to report observations of urchin disease. The recently published paper by Hewson et al. “Densovirus associated with sea-star wasting disease and mass mortality” provides evidence for a link between a densovirus (SSaDV) and sea star wasting syndrome (SSWS). This is an important piece of the SSWS puzzle, but we want to stress that there is still much work to be done before this mysterious disease is fully understood. Importantly, Hewson’s testing of sea star tissue collected from as far back as 1942 indicates that the SSaDV has been around for a long time, yet has never resulted in mass mortality on the geographic or temporal scale we are currently witnessing. Thus, while a culprit may have been identified, we still don’t fully understand the cause. The complete story is likely a complex interaction of multiple factors, and may involve different factors in different regions. For example, the emergence of SSWS in some areas appears to be correlated with increased water temperature, but this does not apply generally across the entire west coast. Finally, the discovery that the SSaDV is present in other echinoderms, such as urchins, which are not currently experiencing mass mortality, suggests that these species could serve as “reservoirs” for the virus that could continue to infect sea stars for many years to come. It may also be only a matter of time before we see broad-scale mortality of other echinoderm species, including urchins and sea cucumbers. Sea Star Wasting Syndrome (SSWS) continues to be observed along the West Coast of North America. The known current geographical range has not expanded much since the last update, though unfortunately some gaps within the range have now filled in as also being affected. The Anchorage Museum continues to be the most northern known location at which SSWS has been observed, though the most recent northern observation in the field was Peterson Bay, Alaska, southwest of Anchorage, in late July of this year. The current most southern known location for this event of SSWS was on North Coronado Island, in northern Baja California from early April this year. Unfortunately, this past spring, sea star populations began crashing in some areas where disease presence had previously been minimal or absent, and high rates of disease were documented among the remaining individuals. The most noteworthy region was the Oregon coastline. At rocky intertidal sites along the Oregon coast in late April 2014, the percent of diseased ochre stars (Pisaster ochraceus) was less than 1% of those surveyed and abundances of ochre stars were within normal ranges, based on long-term monitoring. By late June 2014, those same sites had significantly lower abundances of ochre stars, and of those remaining, the percent showing disease ranged from 18-64%. It is unknown why that stretch of coast was not impacted until much later than most of the rest of the affected range. During long-term monitoring of MARINe sites done in fall 2013, 39% of sites surveyed by the UCSC team in central and northern CA showed high levels of wasting. By summer 2014, 87% of sites sampled in spring and summer had high levels of wasting. One encouraging finding was the presence of many juvenile sea stars at some sites where ochre star populations have been devastated by SSWS. During spring 2014 surveys of long-term rocky intertidal sea star plots, several sites in the Monterey Bay region had numbers of juvenile sea stars higher than ever recorded during the monitoring period (generally around 15 years). Almost universally, there has been a decline in abundance of large ochre stars; some of these sites had numbers of juveniles far above average, while others had only average or no recruitment. Long-term monitoring surveys this fall will allow us to see whether the juvenile sea stars seen this past spring have survived, and whether the influx of juveniles has extended to additional sites. Only time will tell whether these juveniles will grow to replenish the populations at some sites, or whether they too will become afflicted with the disease. Our monitoring continues to track the occurrence of SSWS along the coast and we encourage other researchers as well as the public to continue to submit observations to our database via our website. We are, however, beginning a new phase of monitoring, focusing on 1) the possible ecological consequences this disease may have on the communities in which sea stars live and 2) the potential for recovery of sea star populations, particularly in areas where we are seeing an influx of juvenile stars. For more information and to submit observations of juveniles, please see our page on Ecological Consequences of SSWS. Over the past year, much of our effort has focused on documenting the progression of sea star wasting syndrome (SSWS) along the West Coast of North America and across a range of sea star species. That effort continues, however, we are now moving into a new phase in the assessment of sea star wasting: the ecological consequences from the loss of these species. For more information, please visit this page. While the geographical range for which we have received reports of sea star wasting syndrome has expanded little since the last update (the southernmost observation is now San Diego County rather than Orange County, CA), we continue to fill in gaps in spatial coverage. Observations are coming from MARINe Long-Term Monitoring and citizen science groups such as LiMPETS (Long-Term Monitoring Program and Experiential Training for Students), colleagues at a number of universities and government agencies, as well as the general public. In addition, sea star assessment surveys are now being done by a team from UC Santa Cruz, with their entire focus being the assessment of sea star condition in areas with less frequent monitoring. In Washington, rapid funding from WA Sea Grant and National Science Foundation (NSF) is being used to survey intertidal and near-shore areas of the coastline where we have little to no information about sea star populations. Recently surveyed areas include: 1) the north coast of the Olympic Peninsula, from Salt Creek to Port Townsend, 2) Whidbey Island, and 3) the mainland coast near Bellingham. Additional surveys are being done in the San Juan Islands by researchers at Friday Harbor Labs. Rapid funding is also being used to train citizen science groups to implement sea star monitoring protocols. Thus far, citizen science monitoring sites have been established on Bainbridge Island and at Edmonds Underwater Park, with many more in the works. Results from recent surveys show that wasting syndrome has heavily impacted several species of sea stars at sites in the Puget Sound region, but the impact appears to be much lower farther to the north (along the northeast coast of Whidbey Island, in the San Juan Islands, and around Bellingham), and to the west along the Strait of Juan de Fuca. In Oregon, wasting syndrome in sea stars has been observed at two sites. However, the populations have remained stable and the percent affected has been very low. The UC Santa Cruz survey team will visit several of our long-term monitoring sites at the end of January to help fill in some of the gaps in our knowledge about the presence of wasting along the OR coast. Researchers at UC Santa Cruz have recently visited the northern coast of California and observed diseased individuals at 7 of 8 sites between Crescent City and Bodega Bay, though the percent affected was low at these sites. Reports from others in this region include sites with only apparently healthy individuals, so symptoms of wasting syndrome continue to be patchy, though widespread. UC Santa Cruz is teaming up with divers from the Monterey Bay National Marine Sanctuary to re-survey PISCO (Partnership for Interdisciplinary Studies of Coastal Oceans) subtidal sites from Santa Cruz to Santa Barbara with historic sea star data. Wherever possible, these will be paired with our intertidal monitoring sites, which will allow for a more complete understanding of the impacts of wasting syndrome. Evidence from the few areas where we have both intertidal and subtidal survey data suggest that the effects of wasting syndrome may be more severe subtidally vs. intertidally. These subtidal surveys are urgently needed because we are receiving numerous, new reports from the mainland Santa Barbara area about wasting sea stars. Thus far, the Channel Islands appear largely unaffected by wasting syndrome. A few ochre stars showing signs of the disease were found on San Clemente and Santa Rosa Islands, but no sick individuals have been reported from San Nicolas, Santa Cruz, Santa Barbara, Anacapa, or Catalina Islands. ROV surveys around oil platforms south of Santa Barbara also did not turn up diseased sea stars. However, a collection of apparently healthy sea stars from Catalina Island were brought to the California Science Center, and within a few days many were showing signs of wasting. Veterinarians at the center are currently experimenting with various treatments, which may aid in determining the cause of this wasting event. One potentially positive finding has been an apparent increase in the observation of sea stars re-growing lost arms. While arm-regrowth is not unusual in sea stars, the number of individuals recently observed with new arm “buds” has been higher than typically noted in some areas. In addition, we have noticed sea stars with what appear to be “scars” from healed lesions. Both of these observations suggest that sea stars can potentially recover from the effects of wasting syndrome. The cause of the wasting event is still unknown. Researchers from universities including Cornell, University of Rhode Island, Brown, and Roger Williams continue to work to determine whether the root cause of the disease can be attributed to a pathogen, and many groups are looking for patterns in the geographic extent and spread of wasting syndrome, which might suggest certain environmental factors as possible causes. There has been substantial speculation in the media that the disease could be a result of increased radiation from the nuclear power plant disaster in Fukushima, Japan. We have no evidence to suggest that radiation is a likely culprit. We continue to receive many reports of sea star wasting along the West Coast of the United States. To date, our most northern report comes from the Anchorage Museum in Alaska. There, mottled sea stars (Evasterias spp.) in the aquarium showed signs of wasting. These individuals were collected from Whittier, AK and Seward, AK, though it is unknown at what point they became sick. During the last couple weeks, the UC Santa Cruz group sampled a number of our Long-Term Monitoring sites in central California. Most sites had at least a few affected individuals of the ochre star (Pisaster ochraceus). We were able to confirm presence of wasting in San Luis Obispo County, though diseased individuals were less prevalent overall than what we have observed in the Santa Cruz County area. Intertidal Long-Term Monitoring plots at Hopkins Marine Station were recently sampled with only approximately 2 ½ weeks in between surveys. When sampled on October 18, there were no signs of disease, and the abundances in the plots were within fluctuations documented since we established monitoring plots in 1999. We resampled the plots on Nov 5 and observed disease in about half of the ochre stars (Pisaster ochraceus). Overall abundance had dropped quite a bit, lower than recorded anytime during the previous 14 years of monitoring. We also received reports that in the subtidal off Hopkins Marine Station, sunflower stars (Pycnopodia helianthoides) had been abundant several weeks ago, but during a recent class dive trip, none were observed (Raimondi pers. com.). Observations such as these emphasize how quickly sea stars can go from appearing healthy to dying from whatever is causing this wasting event. Currently, our most southern report along the West Coast comes from Laguna Beach in Orange County, CA. Based on our collected observations to date, it seems that while wasting syndrome is present in southern California, the percent of affected individuals is much lower than what has been documented farther north. The cause of the wasting event is still unknown. Researchers from universities including Cornell, University of Rhode Island, Brown, and Roger Williams continue to work to determine the pathogen. Signs of sea star wasting disease have been popping up on both the East and West Coasts of the United States, as well as reports globally. On the West Coast, sea star wasting has been observed as far north as Southeast Alaska, and as far south as Orange County, California. To date, we have received reports of at least 10 species of sea stars showing signs of infection. Reports of sea star disease and mortality on the East Coast began showing up in articles during July of this year. On the West Coast, sea star wasting was first documented in June (although see Bates et al. for 2008 event), and by September observations were much more widespread, with accounts of diseased, dying and dead sea stars from numerous locations along the West Coast. The first evidence of a possible wasting event came in June when Long-Term Monitoring sites in Washington (monitored by Olympic National Park) recorded diseased stars with percent affected rates between 3-26%. Symptoms of wasting disease in a few Pisaster ochraceus were also noted in August at an intertidal Biodiversity site in Southeast Alaska. Articles from British Columbia, Canada report sightings of dozens of dead sea stars (notably Pycnopodia helianthoides) beginning in September, not far from Vancouver. One report from Vashon Island in Puget Sound indicates signs of wasting in Pycnopodia helianthoides from March of this year. This is the earliest account we have on the West Coast for 2013. From Friday Harbor Laboratories, we have received a report of diseased Henricia spp. and Evasterias troschelii at the southern tip of San Juan Island. In Oregon, we saw no obvious signs of wasting sea stars during Long-Term Monitoring surveys in May-August. Word-of-mouth accounts indicate that there may be wasting occurring at some sites in Oregon, and we hope to have more information from that section of coast soon. In California, accounts of wasting in sea stars range from just north of Bodega Bay down to Orange County. In the Bodega Bay area there have been reports of wasting in sea stars both subtidally and intertidally. Researchers from UC Davis Bodega Marine Laboratory have observed wasting in Pisaster ochraceus in the intertidal at Schoolhouse Rock, just north of Bodega Bay, since spring 2013. In San Francisco, at the Gulf of the Farallones National Marine Sanctuary office building, Pisaster ochraceus in the office aquarium began “falling apart” in early October. Numerous observations of wasting in sea stars have recently been made in the region between San Francisco south to Big Sur. Accounts have come by way of Long-Term Monitoring from MARINe, LiMPETS, and PISCO, and from researchers from multiple institutions such as Long Marine Lab, Monterey Bay Aquarium Research Institute (MBARI), Monterey Bay Aquarium, and Moss Landing Marine Laboratories, as well as from recreational divers. In central California, species affected thus far include Pisaster ochraceus, Pisaster brevispinus, Pisaster giganteus, Dermasterias imbricata, Asterina (Patiria) miniata, Orthasterias koehleri, Pycnopodia helianthoides, and Henricia spp. Interestingly, observations of wasting are patchy. For example, wasting sea stars have been seen subtidally off of Hopkins Marine Station in Monterey, but extensive searching in the intertidal nearby turned up only healthy looking individuals and abundances are within the natural fluctuation observed in Long-Term Monitoring plots at that site. Multiple other sites, however, have shown drastic declines in abundance below the fluctuation typically observed at those sites. In San Luis Obispo County, reports of wasting come from Corallina Cove in Montaña de Oro State Park. There, a CA State Parks scientist received information that sea stars were washing up on the beach; it has not yet been confirmed that this could be attributed to wasting. The cause of this wasting event is still unknown, though researchers from various universities including Cornell, University of Rhode Island, Brown, and Roger Williams are currently working to identify the pathogen. For more information about Sea Star Wasting Disease, please see visit our Articles, Publications, and News Broadcasts page.